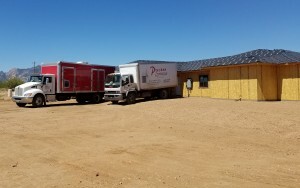 The spray foam installers at USI Preston Insulation recently worked on a new construction single family residential home in Dragoon, Arizona. On average, there are 284 sunny days per year in this part of the country and high temps in July are around 95 degrees. The homeowner wanted their home to have a tightly sealed building envelope to allow for the least amount of heat transfer from the exterior of the home to the interior. The customer chose USI because of our reputation for quality and reliability and we were proud to deliver. The product used is better known as OCX, by Accella Polyurethane Systems. OCX meets the requirements under the NFP286 AC377 appendix X fire testing allowing the foam to be left exposed without the additional – normally required – ignition barrier coating. This allows for a faster install and less labor compared to using a product that requires a secondary intumescent coating to be sprayed over the foam 24 hours after application in order to meet code. The install went very smooth, however, the crew ran into an issue. The area where the garage separation wall was to be built would not allow proper entry from the attic access to the A/C condenser unit. The access was built on the outside of the original building envelope with the A/C unit on the inside. The whole idea is to keep the air conditioned space inside the envelope and the unconditioned space outside of the envelope. Where the access was built it would not allow for this to happen so the crew had to reconfigure where the separation wall was built in order to keep both the attic access and the A/C unit inside the envelope. By sealing off the eaves and encapsulating the attic roof deck, this allows the hot air from outside of the home to stay outside and the air conditioning to work less by staying cool in the attic space. The walls were sprayed to close up all the exterior gaps and penetrations that were created during the building of the home and also to keep the hot desert heat from penetrating through the walls. By creating this sealed envelope the house will be air tight which cuts down the chances of mold growth significantly. Without air transfer from hot to cold there is less moisture, therefore less of a opportunity for mold to grow. With this application and the design of the house, it will achieve a much cleaner, safer, and more energy efficient home for as long as the home exists. The foam doesn’t break down over time, like fiberglass does, which allows a lifetime of maximum heat resistance along with comfort and energy savings. For more information on spray foam insulation, contact us by finding a branch first. USI believes in excellence in every step of the process and ensures timely completion and quality of service, time after time. If you have spray foam installation experience and are looking for a new opportunity, check out our hiring page.